The Remote Operated Vehicle was lowered down the center compartment of the New Brunswick Mine Shaft. In February 2018 Rise Gold and Advanced Marine conducting an underwater survey of the New Brunswick Shaft using a Remote Operated Vehicle. The shaft and timberwork were observed and recorded by the ROV during the survey and appear to be in good condition. The ROV entered into the B580 Level shaft station during the survey. Drill Hole B-17-01 intersected a second zone of mineralization at a depth of approximately 930 m below surface. The interval assayed 4.5 gpt gold over 15.2 meters, including 31.4 gpt gold over 2.0 meters. Diamond drill hole B-17-01 was completed in late November 2017. The Drillhole had a total length of 1419 m (4654 ft) and reached a depth of ~1157 m (3794 ft) below surface. The New Brunswick Vertical mine shaft goes to a depth of 3400 ft (~1 km) and has three wood lined compartments. The timber was neatly cut and removed to the water line and the three compartments look to be open and intact. The visible remains of the historic past-producing Idaho-Maryland Mine include the New Brunswick shaft and adjacent concrete rock silo. In 1942 the mill at New Brunswick was modernized, new headframe was constructed, and new crusher plants, hoists and new compressors were installed. The upgrades gave the corporation one of the finest and most efficient plants in the County "This equipment was designed to handle 2,000 tons a day from depths of 5,000ft" (Pehrson & Needham, 1943). The New Brunswick shaft sinking was completed to 3,470ft (1,058m). The Idaho-Maryland Mine Property includes two parts of fee simple land, the Idaho Land and the Brunswick Land. The Idaho Land represents 56 acres (23 hectares) in Nevada County near Grass Valley, CA. The Mill Site Property, located directly adjacent the Brunswick Land, represents 82 acres (33 hectares) fee simple land. The Mill Site property has a leveled area of approximately 40 acres and an ~4 acre settling pond. The Idaho-Maryland Mine Property includes two parts of fee simple land, the Brunswick Land and the Idaho Land. The Brunswick Land represents 37 acres (15 hectares) in Nevada County near Grass Valley, CA. The photo shows the Brunswick shaft and concrete rock silo with the Mill Site Property in the background. Photo looking southeast. Mill Site Property, including ~4 acre settling pond, shown in the foreground. Brunswick Land, with Brunswick shaft and concrete rock silo, in the background. Brunswick Land; view looking northwest with Grass Valley in the distance. Mine is located approximately 2 miles from the Idaho-Maryland Mine. 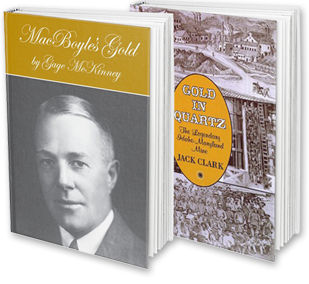 An estimated 5.8M oz gold was produced from the Empire Mine during its operation from 1850 to 1956.